A few weeks ago, over a hundred JewishMOMs sent Mazal Tovs from all over the globe for my neighbor, Talia, who got married last night! I remember Talia crying just this past July after telling us the details of a particularly humiliating date. And now to see her in a wedding dress! Unbelievable! 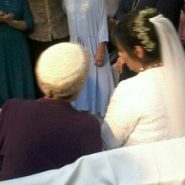 Seeing her, I felt like this must be a taste of what it will be like when Moshiach shows up one day, IY”H. May this incredible simcha be a sign up wonderful good news for the whole Jewish people and the entire world for this coming year! mazel tov to the chattan and kallah! they should build a beautiful home with ahava, achva, shalom and reut. they should have only smachot in their lives! I can’t stop watching and re-watching the video, what a beautiful kallah and what a wonderful wedding! I hope she now receives everything she hoped for in a marriage for all these years of dating and more. She must just be an amazing person to have made it through so many years of waiting without losing her hopes and dreams. can you post a link to the previous article on talia please?